Since 2000 almost every year in September the nanomech meeting takes place in Hückelhoven. 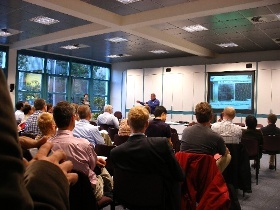 This symposium series organized by SURFACE has been a meeting place for the European nanomechanical testing community, but also for researchers worldwide, as the meeting also includes live video presentations from top international scientists. The focus of the symposium lies on the theory and practice of determining mechanical properties of materials with nanoindentation and other nano-/micro-scale testing techniques. The latest information about the next meeting can be found here.